The Swaminarayan Akshardhham temple situated at Gandhhinagar, Gujarat is a Hindu temple complex was built for 13 consecutive years. 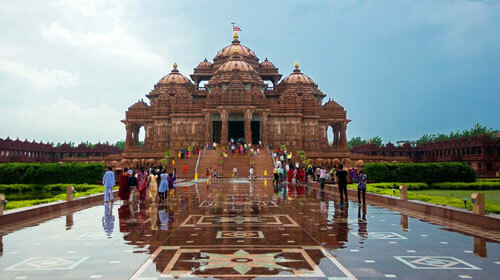 It was inspired by Yogiji Swami and is built as a tribute to Lord Swaminarayan. The Akshardhham Mandir measures 108 feet in height and no steel or iron has been used in the construction of this Mandir. The temple houses the Akshardhham Mandir in the center and it is made of red sandstone which was brought from Rajasthan. The temple was built in the year 1992. Around 8,000,000 volunteer hours by 4000 and more volunteers finished constructing the temple. The temple recently celebrated its Silver Jubliee with much grandeur.